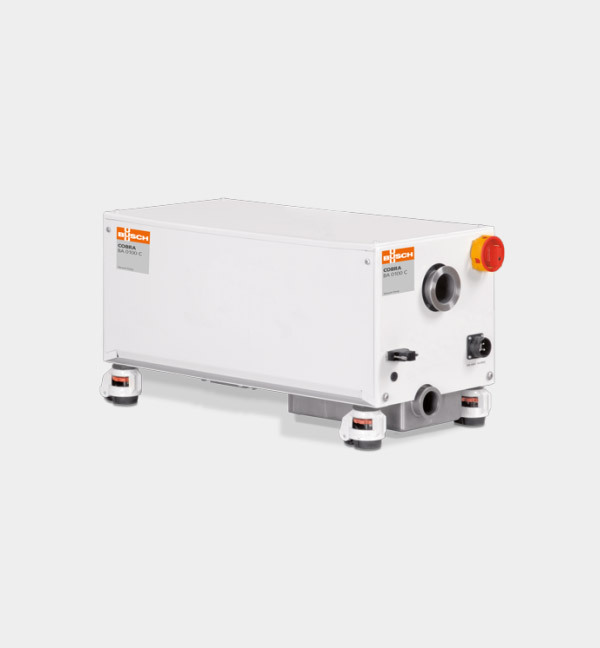 The BUSCH COBRA BA 100 C is the proven dry screw vacuum pump for the evacuation of load-lock chambers and other demanding processes involved in the production of photovoltaic cells, flat panels and semiconductors. With its efficient air cooling and the highest pumping speed in its performance class, this vacuum pump is ideal for all applications requiring effective, fast and reliable vacuum generation. COBRA vacuum pumps are oil- and contact-free, allowing particle-laden media to be evacuated. Due to the sophisticated bell shaped cantilever construction, the twin rotor with variable pitch screws is mounted only on the motor side, while the unique flying bearing design makes inlet bearings unnecessary. As a result, the pumped medium does not come in contact with the bearings. This ensures clean vacuum generation and allows the full recovery of pumped gases. The direct gas path between inlet and outlet prevents dead spaces and ensures there are no process deposits inside the compression chamber. The patented self-balancing screw design and screw rotor mounted precisely at the center of gravity ensure excellent running qualities and guarantee high uptime. A directly mounted canned motor makes the dimensions of the COBRA BA series very compact and eliminates dynamic seals.